San Francisco is known and loved around the world for its iconic man-made structures, such as the Golden Gate Bridge, cable cars, and Transamerica Pyramid. Yet its Civic Center, with the grandest collection of monumental municipal buildings in the United States, is often overlooked, drawing less global and local interest, despite its being an urban planning marvel featuring thirteen government office and cultural buildings. In The San Francisco Civic Center, James Haas tells the complete story of San Francisco’s Civic Center and how it became one of the most complete developments envisioned by any American city. Originally planned and designed by John Galen Howard in 1912, the San Francisco Civic Center is considered in both design and materials one of the finest achievements of the American reformist City Beautiful movement, an urban design movement that began more than a century ago. Haas meticulously unravels the Civic Center’s story of perseverance and dysfunction, providing an understanding and appreciation of this local and national treasure. 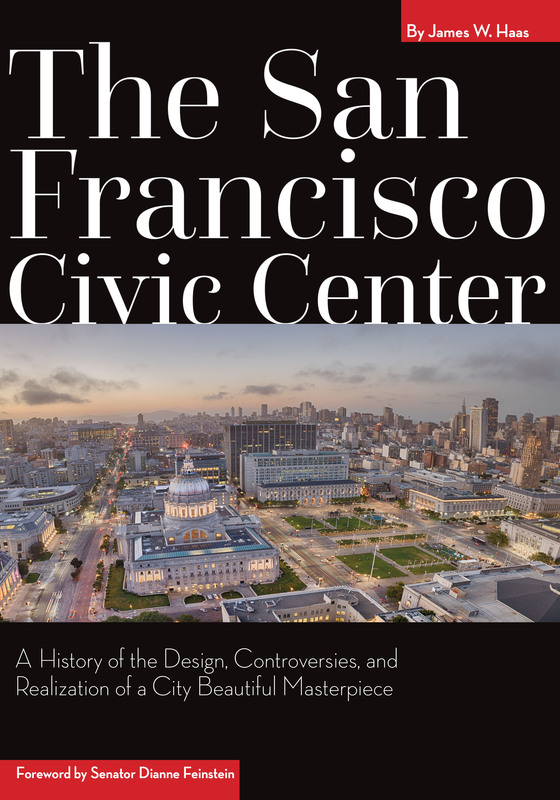 He discusses why the Civic Center was built, how it became central to the urban planning initiatives of San Francisco in the early twentieth century, and how the site held onto its founders’ vision despite heated public debates about its function and achievement. He also delves into the vision for the future and related national trends in city planning and the architectural and art movements that influenced those trends. Riddled with inspiration and leadership as well as controversy, The San Francisco Civic Center, much like the complex itself, is a stunning manifestation of the confident spirit of one of America’s most dynamic and creative cities. James W. Haas is an author, attorney, and expert on San Francisco’s Civic Center history and politics. He has lived in San Francisco most of his life and spent more than forty years engaged in civic projects, including the restoration and completion of San Francisco’s Civic Center.